The Crown were introduced in 1955 in Japan to meet the demands of public transportation. 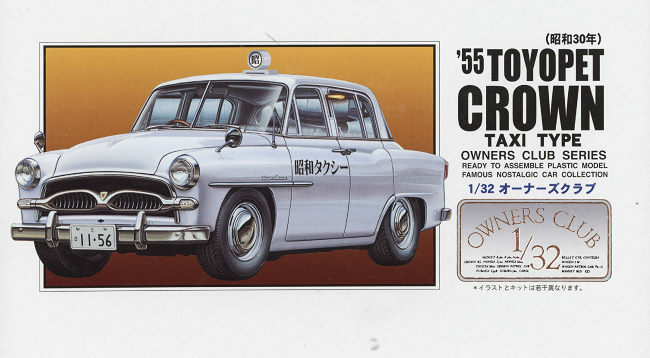 The Crown was intended for private purchase, while the Master served in a commercial form as a taxi, both with the same 1.5 L Type R engine used on their previous car, the Toyopet Super. The front doors open conventionally, and the rear doors are "suicide doors", a feature also utilized on the Toyota AA, Toyota's first car. Small engine displacements were used to keep the vehicle affordable, as the Japanese Government began to impose an annual road tax to help develop and maintain a national transportation infrastructure in 1950. The appearance of the Crown shows some similarities with the European Ford Versailles and Simca Vedette. The Crown was much more popular than the Master due to the more compliant suspension of the Crown, and while the Master was intended for taxi service, the Crown was more accepted by the market over the Master, and more Crowns were sold into taxi service than the Master. The Crown was designed to replace the Super but Toyota was not sure if its independent front coil suspension and its suicide type rear doors were too radical for the taxi market to bear. So the Super was updated, renamed the Master and sold in tandem to the Crown, at Toyota Store locations. When sales of the Crown proved worthwhile, the Master was discontinued in November 1956 after being in production for only one year, and production facilities for the Master were transferred to the Crown. While the Master was discontinued the commercial vehicle based thereon, the Masterline, continued to be offered (utilities, wagons and vans) until 1959. A six-door wagon known as the Airport Limousine was shown as a concept car at the 1961 Tokyo Motor Show. It did not go into production. In December 1955 the Crown Deluxe (RSD) was introduced, a posher model equipped with a radio and heater as standard. The initial RS model received a cosmetic update in 1958 to become the RS20, now with hooded headlights and a single-piece front windshield. In October 1959 Japan's first diesel-engined passenger car, the Crown Diesel, was introduced. Its C-series engine only had 40 PS (29 kW). In October 1960 the 1.5 L R engine was complemented by the larger 1.9 L (1,896 cc) 3R engine for a model called the RS30, originally only available in the Deluxe version. The 1900 was also available with the new two-speed Toyoglide automatic transmission. In April 1961 a Crown Standard 1900 was added. First off, I should mention that Arii and MicroAce are the same company. I have been buying MicroAce trains for a number of years and it seems that Arii wants to make a changeover of its corporate name. Like all of the Arii kits in this series, is a curbside (which means the kit does not have an engine). Typical of the series, there are no chrome parts, those requiring the modeler to paint. Fortunately for the modern builder, there are several excellent chrome paints on the market. Construction is quite simple and you will spend most of your time painting. The interior is a full floor pan with wheel wells into which you attach the seats and interior door panels. When building this you also install the wheels and axles. You have one plastic and one metal axle. Wheels are separate from the rubber tires. The axle housing in the rear needs to be installed prior to the rear axle assembly. There are decals for the instruments and you have a stick shift and parking brake to install in the center console. The instrument panel with steering wheel installs in the body and this must be installed after the one piece window part. The front and rear of the body are separate parts and it would be recommended to paint the body after gluing on the front and rear panel, but before installing anything else. Headlight lenses are separate clear items as are the tail lights and turn signals. I have had success painting the area behind these last two items with white or chrome and using orange and red Sharpies for color. Once all the bits are attached to the body, it can be glued to the chassis and the exhaust pipe added. This car is equipped with trafficators (or at least that is what they look like) and can be modeled extended . Since this is the taxi boxing, there is a light for the roof. Instructions are a single folded sheet with pretty much everything in Japanese. Fortunately, the construction drawings are well done and should not be an issue. You are fairly well on your own in terms of color, however, there are plenty of images on the 'net to help. The small decal sheet is well done and has proven to work quite well on previous kits. 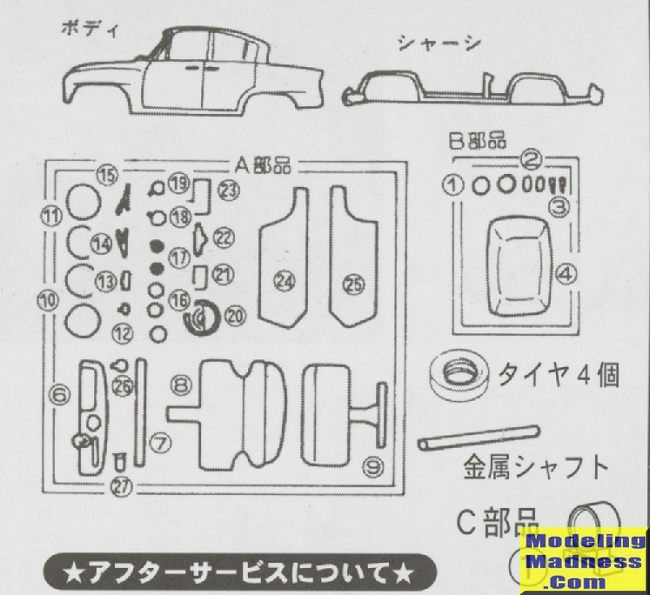 These kits are a nice distraction from the usual for those of use who don't usually do cars. For those who do, they can provide a break from the normal scale. No one will ever call this car good looking, but it is typical of 1950s design.